W J C: Patrick's Beloved Tattoo. Inevitably, telescopes and guitars away, the ales would come out. This in turn would soon lead to Patrick, once again, revealing his beloved Map of The Moon. 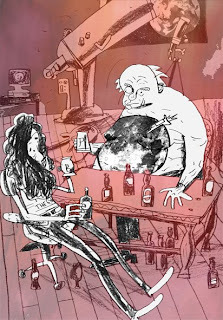 In a fair world, THE ADVENTURES OF BRIAN MAY AND PATRICK MOORE, DRUNKEN ASTRONOMERS would be a top-selling comic book. If only. They're a lovely couple. Prelude to a right hoo-ha. The Interview continues . . . Meanwhile, at the Troll Station. So the sun comes out and then . . .